I made good progress with the conversion of the Stranded III UI system from Lua to C# (as mentioned in the previous blog entry). Now as the UI elements are programmed in C# instead of being scripted in Lua, I'll also expose a Lua API for them so you can very easily build your own custom menus. There's finally something visual again. Screw that broing chatter about weird code stuff, right?! 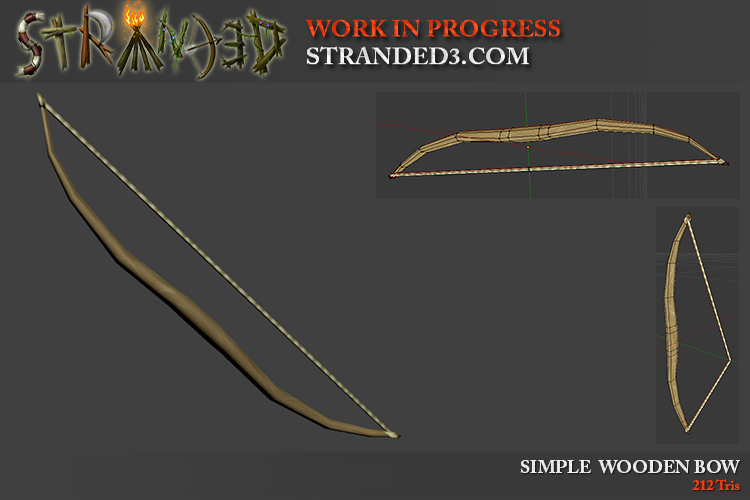 This is a raw and unfinished version of the basic shelter. It's one of the most primitive buildings in the game. The shelter can be built quite quickly and it gives you a minimum protection from bad weather when sleeping. It's a standalone building which means that it is not modular and can't be extended. At least that's the plan for now. I might change that later. Here's a real stone-age tool: The hand axe. It helps you to cut down trees. Of course it's pretty inefficient but still better than no tool at all. I wanted to make the texture look like the stone was processed to make it sharper. This didn't work out well unfortunately but I guess it will do for now. Unfortuantely I made some mistakes when making it. 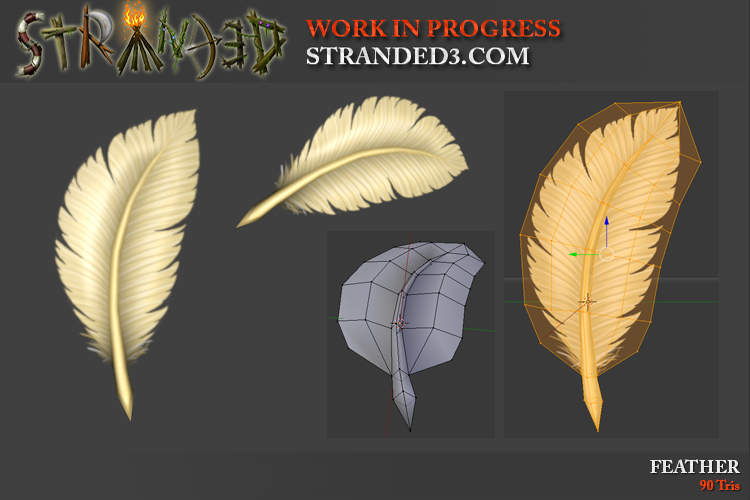 For example I didn't plan ahead properly and first made the 3D model and afterwards painted the feather texture on the exported UV layout. When drawing the texture however I decided to make it more pointy at the upper end which doesn't really match the mesh geometry. Luckily it's not a huge problem as you probably won't notice this flaw in game. Again too much time without a dev blog entry! Sorry! Let's change that! I uploaded some more models to Sketchfab so you can see them in 3D. I put some work in improving a few of the existing models. I made the palm tree bark texture more beautiful for instance. 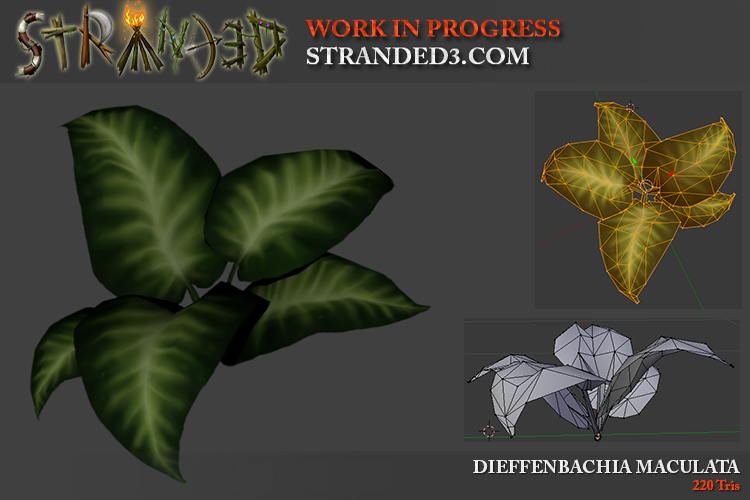 Moreover I improved some bushes because the arrangement of the leaves was too boring and made them look too flat. I also made some new plant variations. For example there are now more "curly" fern versions. I mentioned earlier that I want to move all basic menus (like the settings menu) to the C# code base instead of using Lua for them. This process is nearly done. So not only the UI elements are now C# but also the menus themselves. Of course you will still be able to create custom menus in Lua and for some menus there will be ways to influence/modify them a bit. Moreover you will always be able to add additional elements to existing menus and to add sprites and effects. There also have been some optimizations behind the scenes. I moved all icons used by the UI to the same sprite atlas for example. This way Unity can batch stuff more efficiently and render the menus even faster. 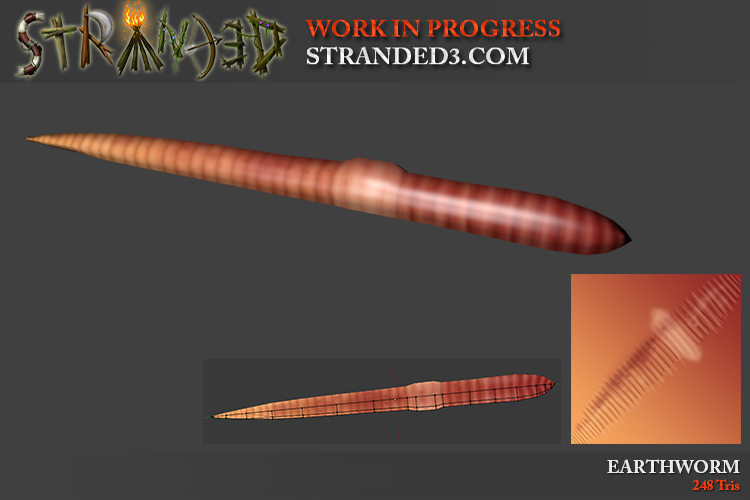 Even though Stranded III's art style doesn't imply high realism I want to be familiar with the mechanics in the game and how they would work in real life. I'm sure that this kind of knowledge helps a lot to make better games. For Counter-Strike 2D for instance it helped me to fulfill my military service at the German Bundeswehr. That way I learned first-hand how real weapons actually work and managed to design them way more accurately in the game with details like recoil animations and muzzle smoke as well as bullet casing particles. Therefore I decided to bake my own bread rolls. And I made pictures to document the process. Just put everything together, knead it very well, let it prove, bake. That's basically it. 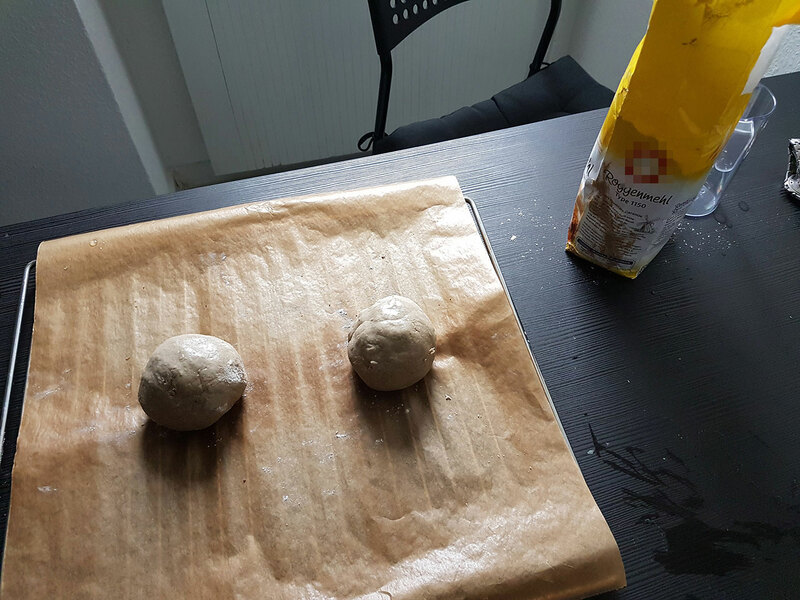 So here you can see the dough proving for 1 hour. 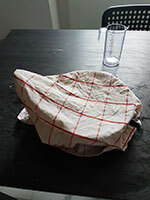 Nicely covered with a wet towel. The ultra sticky dough was actually my main problem during the whole "experiment". It was caused by me not sticking to the recipe. When mixing the stuff the dough felt way too dry. What I should have done more kneading! The worst thing about this: After searching for another recipe on the web I found one which warns you about exactly that mistake. It seems to be a common one among newbies. Oh and in case you wonder: No, I never made any dough before. It felt like wasting half of the dough when washing my hands after kneading because so much of it was stuck to them. It was horrible and no fun at all. This is the dough after proving. 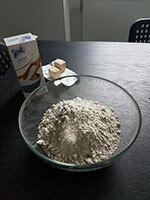 Of course it was still way too wet and I was forced to add more flour to compensate the excess water. I'm not sure how much flour I had to add but it was quite a lot. 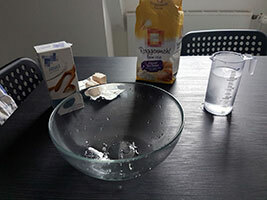 So in the end I probably had more like 400g-450g of flour instead of the planned 250g. Without extra flour I would not have been able to knead the dough properly and neither to form the rolls. By the way: I tried to use the spoon to scrape some dough off my hands and the bowl. It didn't help much. I wish I had photos of my hands after kneading the sticky dough. They looked absolutely disastrous. At that point I didn't dare to touch my smartphone (which I used for the photos) though. 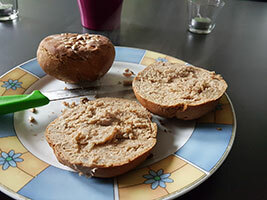 Here are the formed rolls. 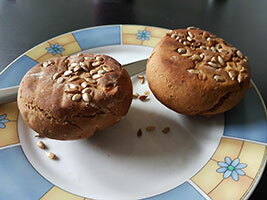 I only wanted to eat two so I saved the rest of the dough which should easily be enough for two other rolls. Fun fact: Note the smudges on the flour bag. That's because I somehow had to pour more flour into the bowl with my messed up hands. Fun fact²: Note the wristwatch. 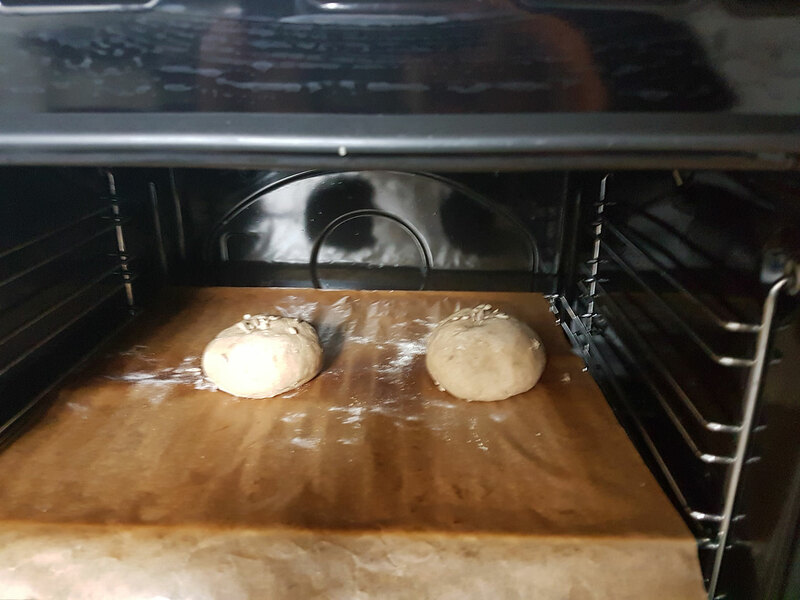 After messing it up with dough as well I decided to take it off for kneading. After forming the rolls there was another short proving phase. Time to bake! Note that I added some sunflower seeds. 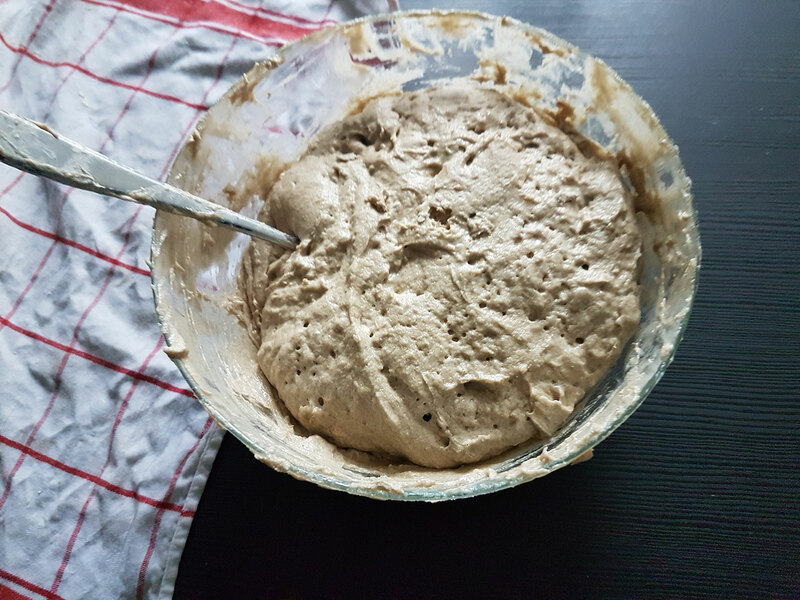 Not only on top and bottom but also to the dough itself while kneading. ... but they were in the oven for too long. ... and this the bottom view. 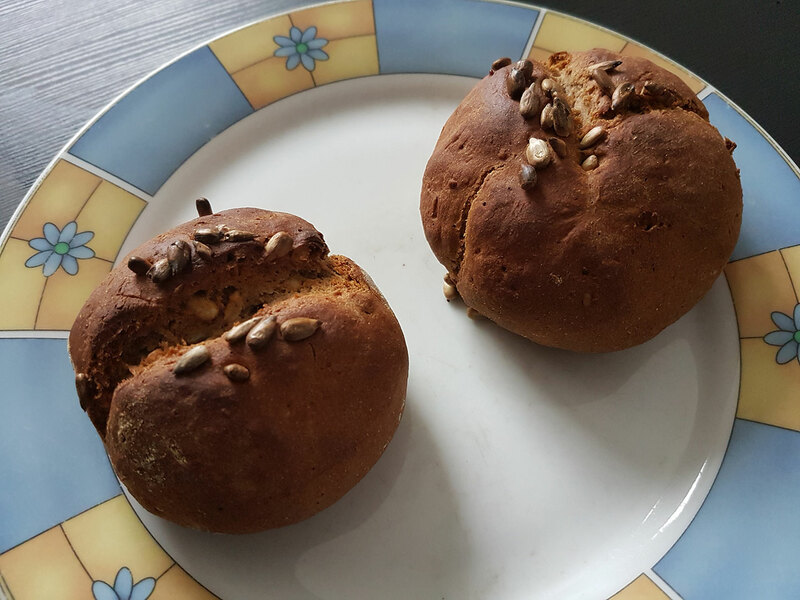 When only looking at the bottom one could think they were bread rolls actually made in a bakery, right?! I then tried to cut one of them with a regular knife and failed. They were too hard. As you might see it was indeed quite dense. Also it wasn't salty enough. 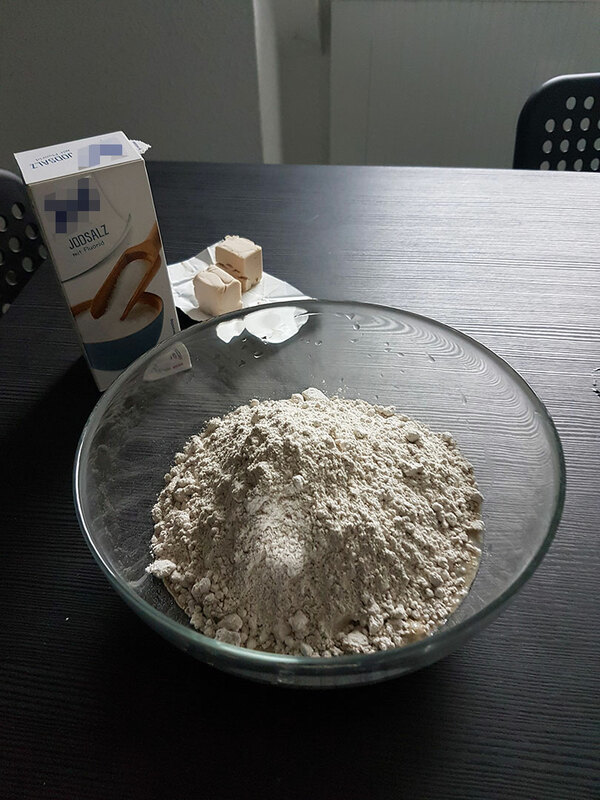 Again a problem probably caused by the additional flour. I have to admit that I already ate better bread rolls but these ones were still quite okay for my very first self-made ones! So what did I learn in the whole process? 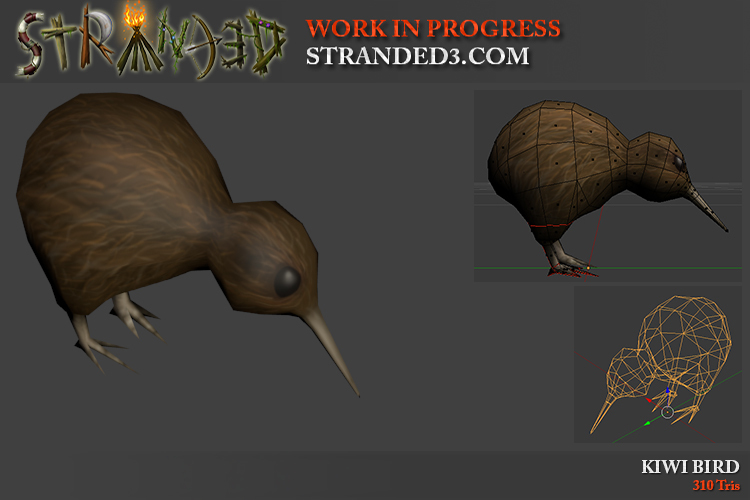 How will this new knowledge affect Stranded III? Will I do more real life research like this in future? Maybe but I have no plans yet. I can't (and don't want to!) try everything which is part of a survival situation however. Y U NO WRITE BLOG ENTRY?! If you don't know CS2D: It's a free tactical top-down multiplayer shooter and working on it helped me to gather a lot of experience in multiplayer game programming. 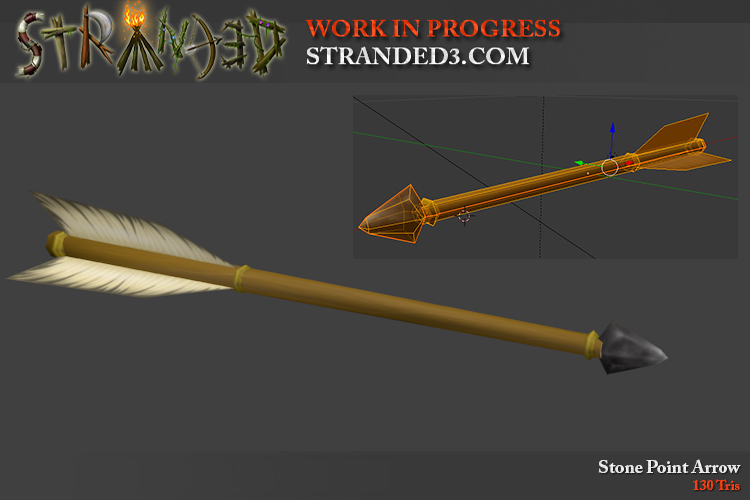 This knowledge will also help me to make Stranded III a better game. Do you like CS2D AND have a Steam account? Then please vote for it on Steam Greenlight! Anyway! 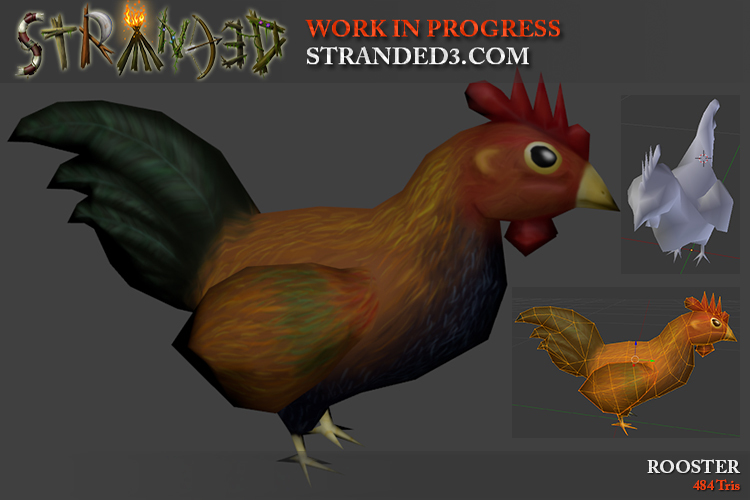 There's also some Stranded III progress! 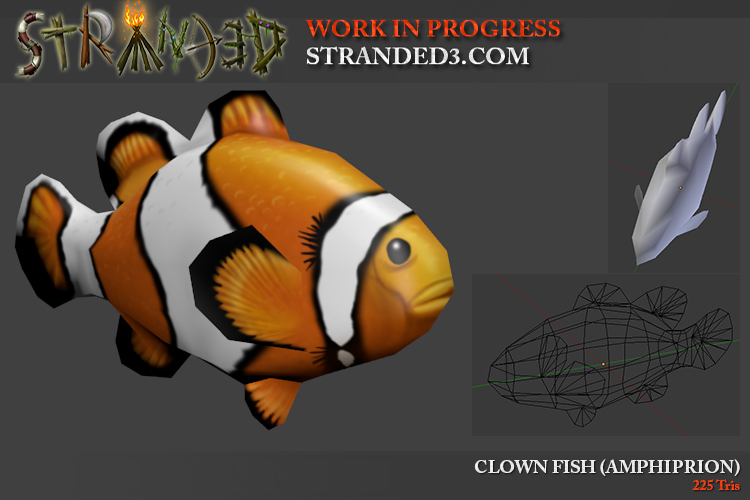 I spent some time making fish models/textures. Missing Nemo? Here you go! 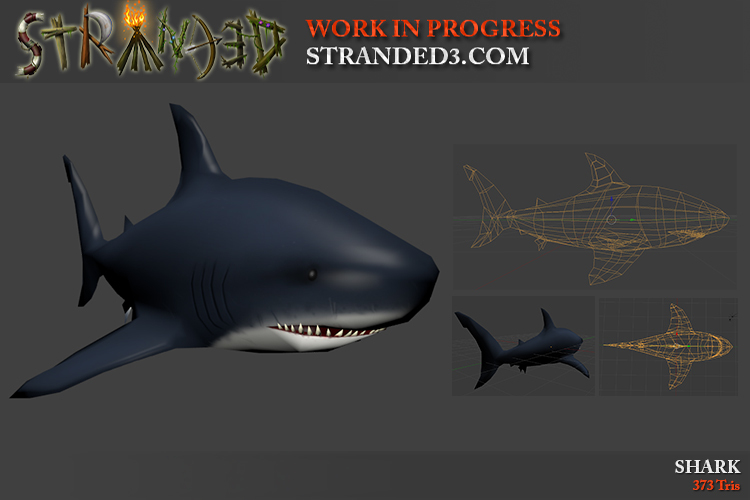 Aaaand I also started working on a shark and made two videos. Note that after taking a look at some other references I decided to adjust the dorsal fin and some other details. I didn't record these changes but you can see the changes on the model when you compare the models in both videos or take a look at the image above which shows the adjusted version. Looks like Unity improved the sorting layer scripting API in one of the 5.X versions! I adjusted my code and made it much cleaner and simpler using the new API. No longer setting layers by string ID and getting the int ID afterwards. I described that ugly hack in dev blog #28 back in 2015 and I'm really happy that it is not required anymore! Eating food is important if you want to survive. So I made some more food models. Drinking is even more important than eating. My current plan is to have containers which can be filled with liquids. With liquids I mean the obvious stuff like water but also other things like wine or milk. Without a proper container you won't be able to take any liquids with you. One of these containers would be.... a bottle. This mesh also has quite some polys. That's because it's round and because the glass has an actual thickness so there are also triangles/faces inside. You can see it if you take a close look at the transparent wire frame pictures. 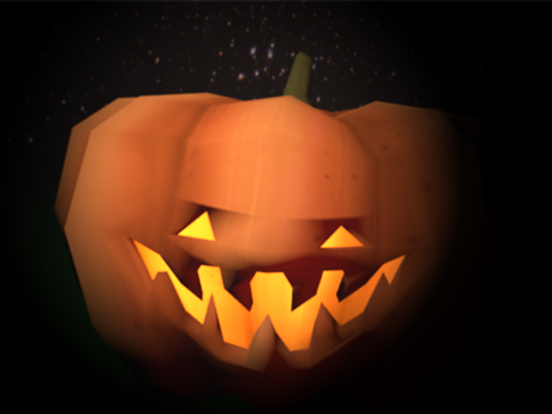 I think the rendered version from Blender looks pretty cool. I hope I can find a proper shader / the right material settings for Unity3D to make it look like this - or maybe even better?! - in-game. I didn't try that yet. All that CS2D Greenlight stuff was kind of distracting for me recently. The good news: CS2D is currently on Rank #1 on Greenlight with nearly 12k yes votes! Thank you all for your amazing support! Do you remember when I wrote about converting the Lua UI elements to C#? I now worked on the Lua API of the C# UI elements so you can use them in Lua to easily and quickly build your own dialogs, windows and UI elements. I also rebuilt the inventory menu now using the new Lua UI API. Most in-game menus will be fully scripted while most of the stuff in the main menu will be hardcoded but extendable. I made a sardine. I'm not convinced by the result yet and I guess I will touch it again later. Luckily sardines are quite small so it's okay for now. Why should I waste video memory and effort for 2D item icons? I have cool 3D meshes! I'm using Graphics.DrawMesh (like I did for the icon preview rendering) this comes with the advantage that no game objects need to be instantiated for the 3D items in the inventory. So I'm basically just getting the axis where the mesh bounds are the highest and then I use that for scaling. 0.32f is used because the UI has a scale of 100 units per pixel and inventory slots have a size of 32x32 pixels. 32/100 = 0.32f. 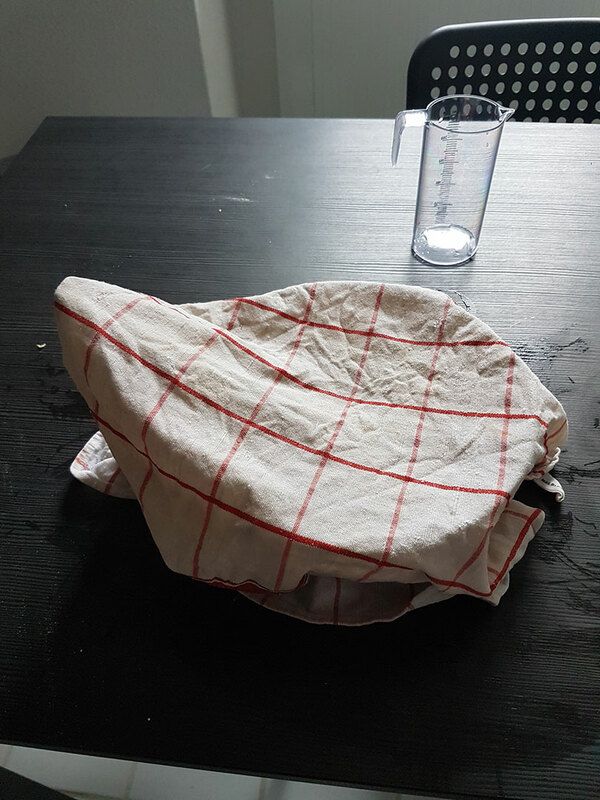 As you can see in the gif some items do not fit perfectly. That's mainly the case for items which are not "centered" in the coordinate system. The best example for this problem are the mushrooms. Their center is at their bottom, not in the middle of the mesh. I guess and hope that it isn't a huge problem to fix that. 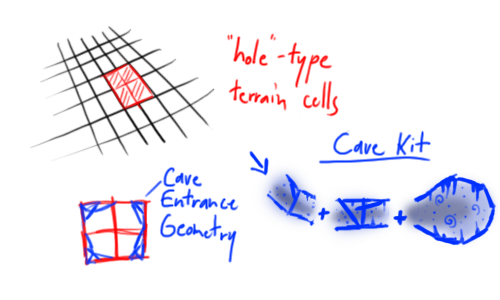 Letting these items rotate around their actual center might be a bit trickier though. By the way regarding rotation: The way the items are rotating in the gif is just an example. The rotation in the final game will look differently. Maybe the items won't rotate at all or only a little bit. I have to find out what looks best. I also plan to make them scale up a bit when you hover them. If you ask yourself what the first item is: It's a backpack without texture and which I accidentally exported with weird and messed up scaling. Oh and please also note that I did not set up the materials for all these items properly yet. They all look a bit glossy and for many it really doesn't make much sense. I know! Sorry for the long* post. 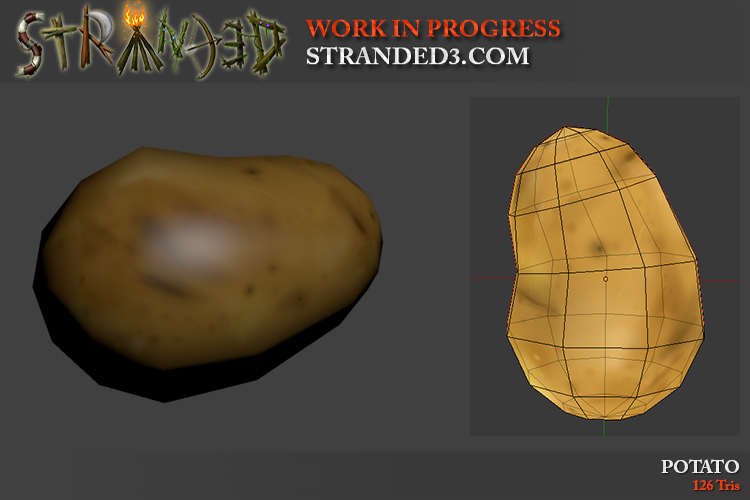 Here's a potato! *) I'm aware that the post is not that long at all. 9gag people will understand. Remember the mushroom problem from last blog entry? The offset? Here you can see the result of that change. No weird offsets anymore! You can also see that I tried less annoying rotation and added a "scale on hover" effect. 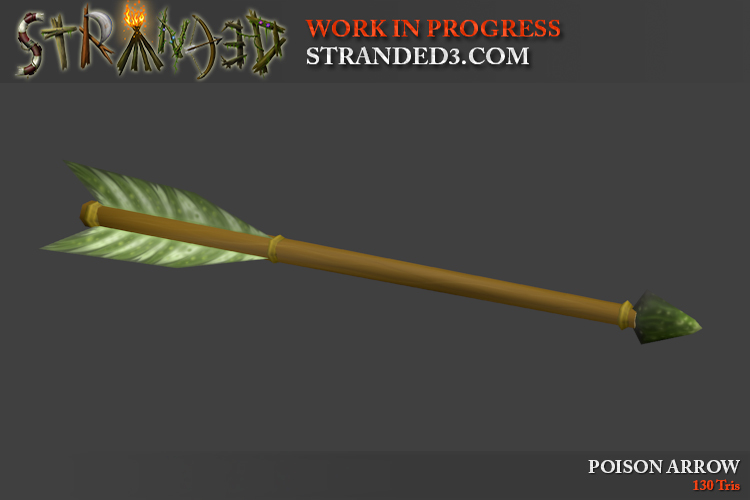 This is still work in progress and needs some fine tuning. Colors are pretty ugly due to bad gif compression. 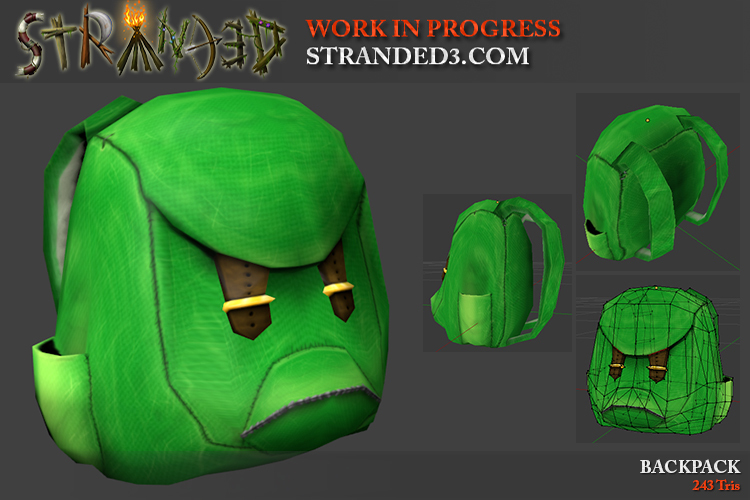 It really annoyed me to see the white backpack in my inventory so I textured it! I should have double checked the geometry before UV mapping. Now there's crazy stretching going on in some places but... hell.. whatever! I did it! I made a model with exactly 100 tris! I didn't even plan it. Coincidence? Fortune? One thing is for sure: It's a tremendous achievement. People will tell the amazing story about the model with exactly one hundred triangles for centuries to come. And what majestic thing did I create while randomly hitting that wonderful triangle count? A snail. 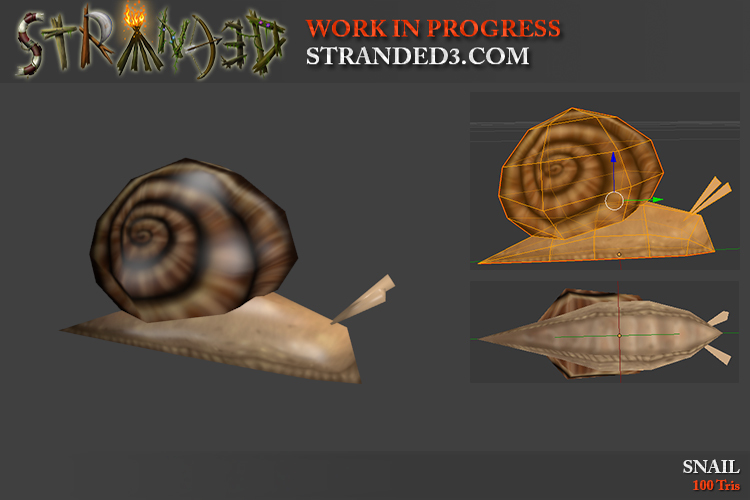 A slimy little snail. Not even a very good one (I screwed something up with the shell and I don't want to talk about it). Great! Another animal! It's a crab! Oh yes, I know, insane triangle count for my standards but... these things have just SO MANY LEGS! I made some arrows. 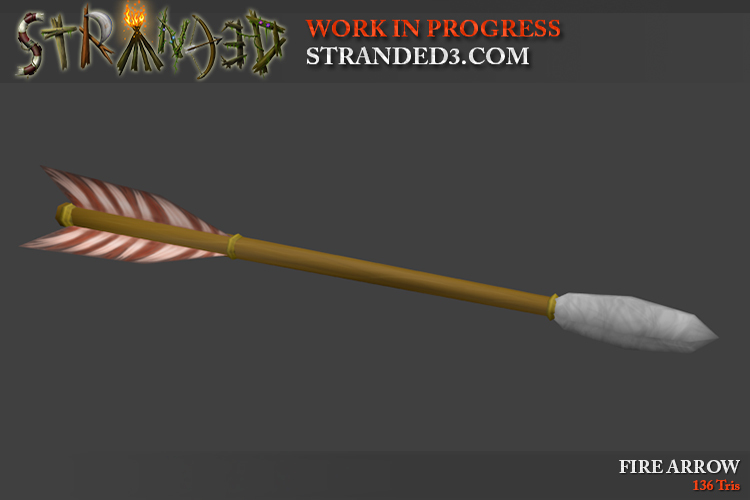 I plan to have more arrow variants in Stranded III than I had in Stranded II. You managed to get some poison somehow? Craft a poison arrow! An arrow with a tranquilizer would also be pretty cool. And I can think of a lot of other arrow types. E.g. other points like metal or teeth or bones. Or replacements for feathers like leaves or duct tape. 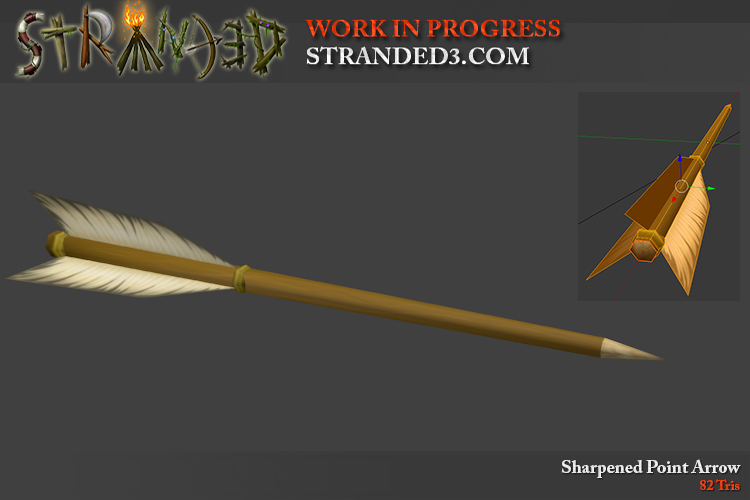 There could even be a simple sharpened stick without feathers or anything. Of course that one would have a pretty low range when used as arrow. Recycling FTW! Ammo boxes normally totally don't look like plastic first aid kits. They are boxy wooden or metal crates. I don't care. 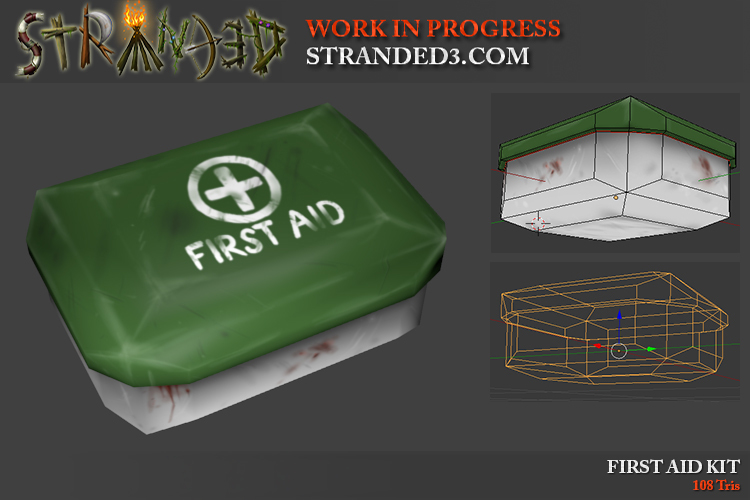 I just took the first aid kit and changed its texture to look a bit like a (somewhat weird) ammo box. Even though this is not what a real world ammo box looks like, I somehow embrace the fact that the boxes/kits in the game look alike. This makes them easily readable for players. I may still decide to change that later. 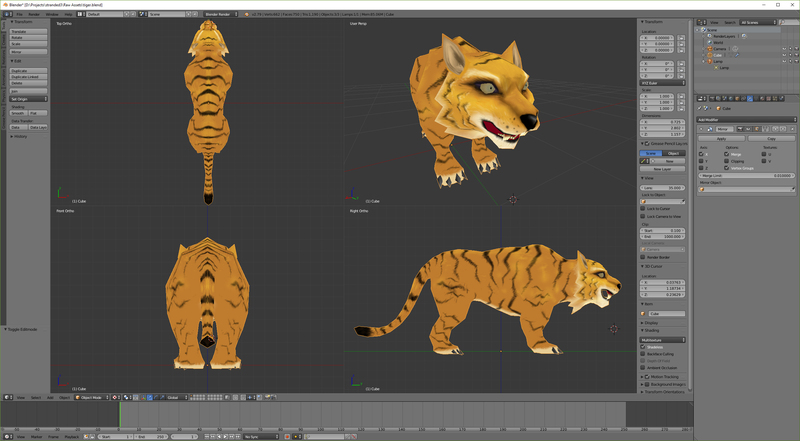 I'm working on a tiger model. You can see my current progress in the following video. It took quite long (over 2h) so I made a 40x time lapse. The video is available in HD @ 60 FPS! I do not blindly model them from my head of course. I have a second screen with reference images and sometimes even reference models. You can't see that screen in the video so I thought it would be good to mention it. 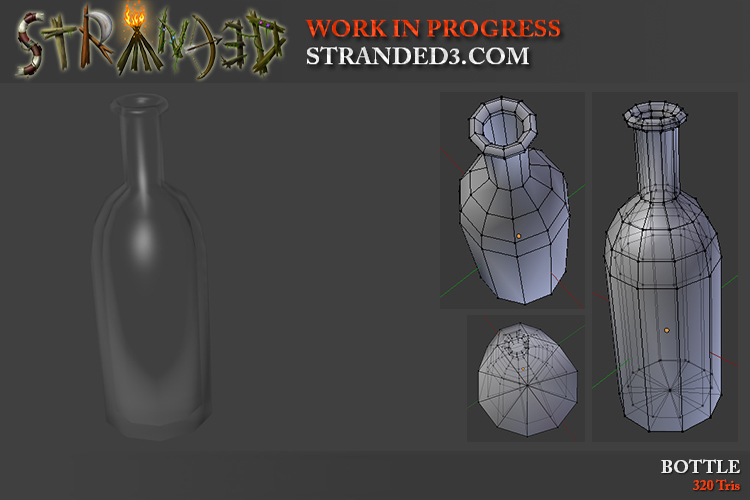 The reference stuff allows me to quickly check proportions and details without minimizing Blender. Watch the taskbar closely and you can see when I switch to Chrome on my second screen to rotate my 3D Sketchfab reference. I use a mirror modifier in Blender. This way I only have to model one side of the model. The other side is just mirrored. Thank god that most animals are symmetrical! Other than that I'm mainly extruding, moving, scaling, rotating, knifing and merging stuff to make my models. For animals I like to start with boxes and to extrude them as required. When I make items I normally don't use the mirror modifier and I start with one of the primitive base shapes from Blender which is closest to what I want to make. Unity recently released the new major version of Unity: Unity 2017. 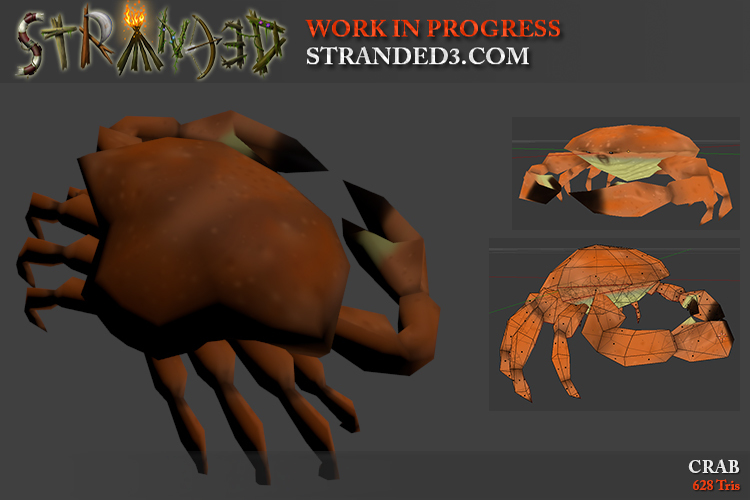 I did not migrate Stranded III to the new version yet but I plan to do so because I want to take advantage of the improvements. The downside of this is Unity's new licensing model. I had a expensive pro License for Unity 5 but they changed their license model to a monthly fee thing. I can understand that this is way better for them but I really hate monthly fees. Especially when they are rather high. My old Unity 5 Pro license is basically worthless now because I can't use Unity 2017 with it. Is that a real problem? No, it isn't. The free version of Unity is basically feature complete. The only advantage of Pro is that you get some additional services and that you don't have to show the Unity splash screen in your game (and some limits in case you sell your games). So I'll keep the free version for now. 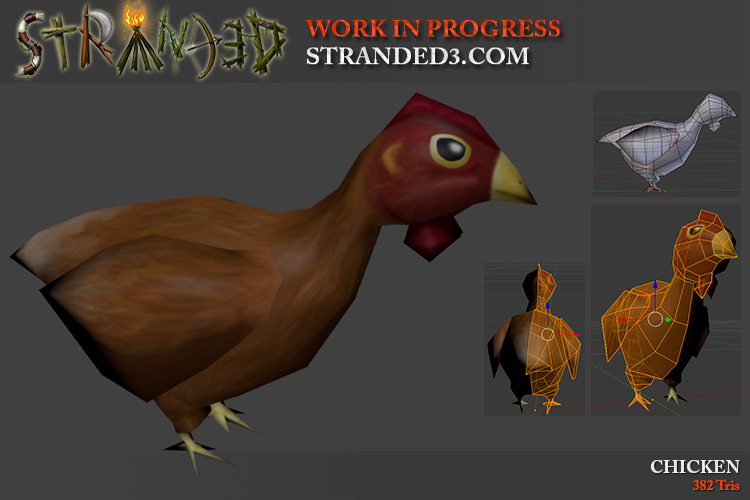 Chickens are great if you need eggs as food or feathers for your arrows! You could also just kill and eat them but who would do that?! There are no plans to make adult and baby animals of each species - that would be too much work - but in some cases I might do so when it has an impact on game play. In this specific case the difference will be that chicken can give you eggs while chicks won't do so. They have to grow up first. I also want to add a rooster later. Having at least one rooster and a chicken would allow you to breed new chicks for even more eggs. But same thing again: I'm not planning to make female and male animals of each species. Wild animals will probably just spawn - depending on some environmental conditions. Wait! 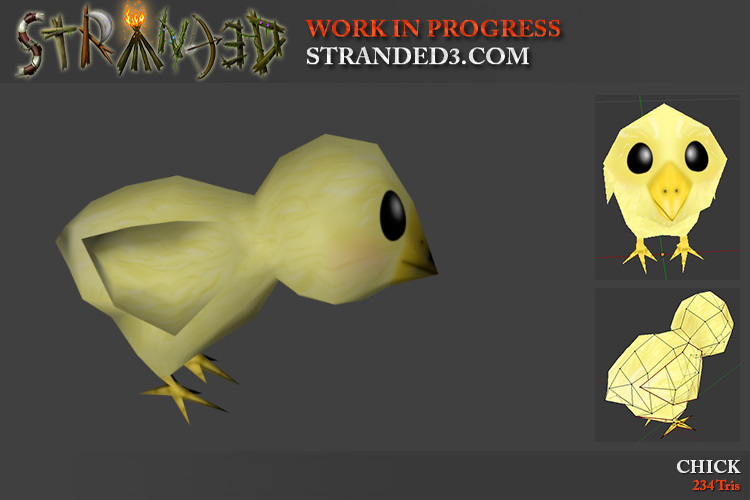 It's February already and there's no Stranded III dev blog entry for this year yet? Let's change that! After writing the last entry, CS2D has been released on Steam which is one of the reasons why I didn't manage to work on Stranded III a lot. 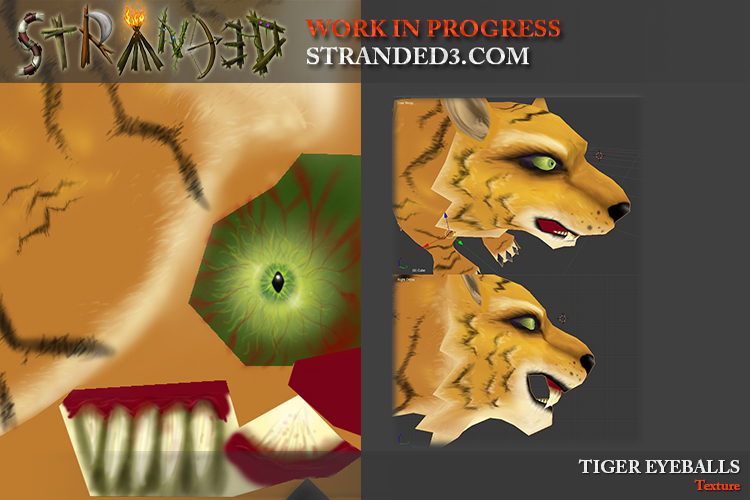 I do have kind of a New Year's resolution though: I will change the way I work on Stranded III and I'll set a deadline for myself. I set the wrong focus during the development of Stranded III. I spent too much time with working on UI stuff and 3D models and I didn't work enough on the actual game. Therefore I do not have a game with fun game play yet which is a difficult and demotivating situation. Also there isn't anything playable worth sharing with you. Therefore my new goal is to develop a very basic playable multiplayer version as soon as possible. I won't care much about the look of it (silly placeholder assets incoming) and I'll focus on functionality. I already put a lot of work into this project and I do not plan to give up. On the other hand however I can't continue like this (working without playable results) forever. Therefore I'll set a deadline: I will either manage to create basic playable multiplayer alpha this year or I'll cancel the development. 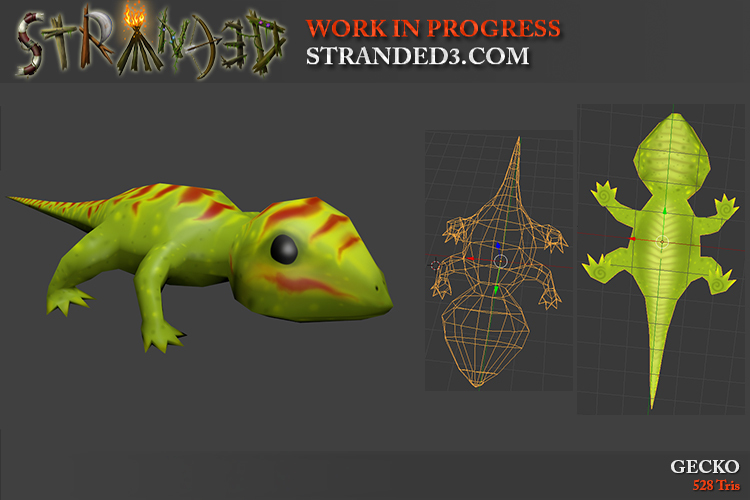 No worries, I'll do my best to make Stranded III happen! The last few weeks I spent a lot of time creating a separate minimalist multiplayer project in Unity which uses my own UDP networking library and which is connected to the U.S.G.N. master server. It's a proof of concept and it's already working. 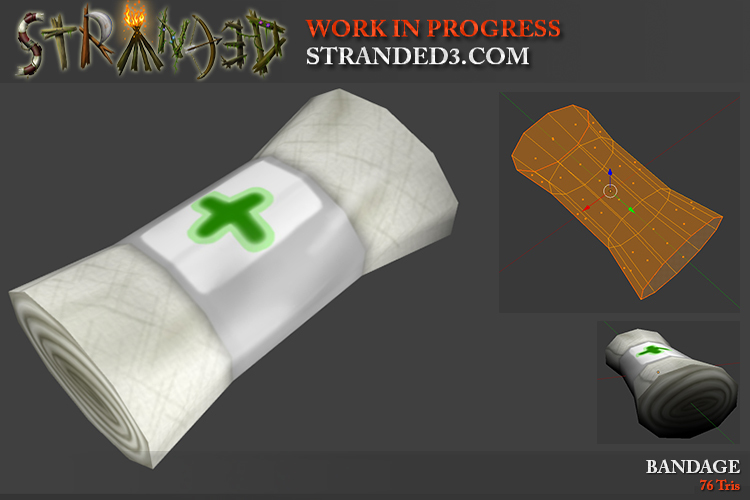 The code and experience I gathered with this will help to improve Stranded III. 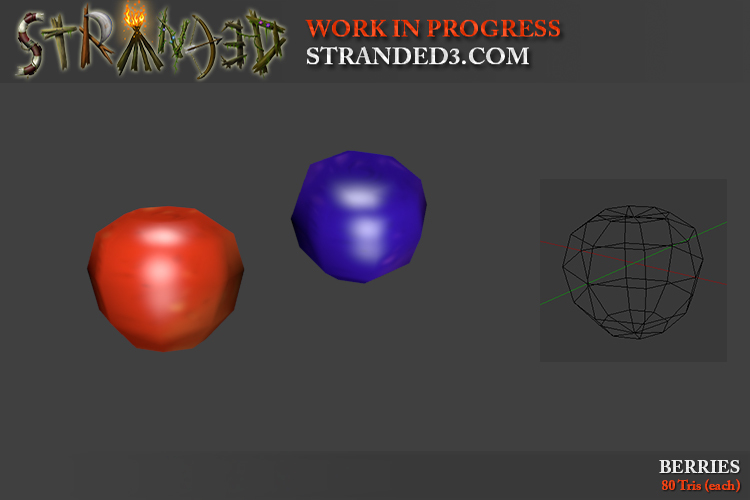 I will try out a few more things and then merge it with the Stranded III code base. My next goal after that is to work on a new terrain system and map topology because I'm really unhappy with Unity's limited terrain system. Blog time! I moved to a new flat (I'm still living in Hamburg), switched my job and updated CS2D since my last entry so unfortunately there wasn't much time to work on Stranded III but I do have some stuff to write about nevertheless! I worked on my network library. It now allows to send packages of (in theory) any size without causing trouble by exceeding the MTU of hardware/software involved in the process of transmitting data over the internet. To achieve this I check the size of a network packet before sending it. When it's too large it's split into multiple packets and some header fields are added. The recipient of the packet will read the header fields and assemble the packet as soon as all required packets arrived. This is actually a very basic thing for a UDP-based network library but it was still missing in my implementation. It's not an essential feature but implementing a game without it means that you have to manually take care that your packets don't get too large. 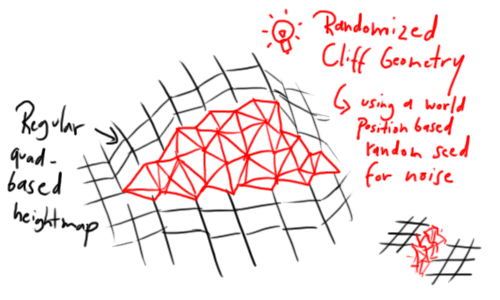 This is what I tried to do in CS2D and www.CarnageContest.com but sometimes it still happened there that packets get too large. This can lead to serious problems like disconnects. Some modems/routers even seem to crash completely and require a restart when you throw oversized packets at them. Fun stuff! So thanks to fully automated packet partition this hopefully won't happen in Stranded III. In my previous blog entry I said that I'm not happy with Unity's terrain and that I wanted to make my own one. I thought a lot about possible map formats, efficient structures to save data etc. and came to the conclusion that I will just stick to the heightmap approach because it's so simple and allows to create natural looking landscapes easily and procdeurally. So most of the landscape will be very simple data-wise and therefore it will also be easy and fast to work with it. Very steep slopes can be converted to cliffs with a rock structure instead of rendering a simple slope with a heavily streteched ugly texture. Since this system is only based on the 2D heights array of the classic heightmap approach big overhangs will not be possible with it. You could still add something like this by manually placing some big rock assets though. I plan to generate the cliffs with actual 3D geometry using randomized patterns. If I don't manage to do so I could just use a triplanar shader instead. Another, way more sophisticated addition is the cave system that I plan to add. It requires additional data in the map because a 2D array of heights is not sufficient to represent underground stuff. To make this work the terrain will allow to define the surface type "hole" which just creates a hole in the terrain surface. An additional data set will then be used to put 3D geometry under that hole. I did not decide how to structure that data. 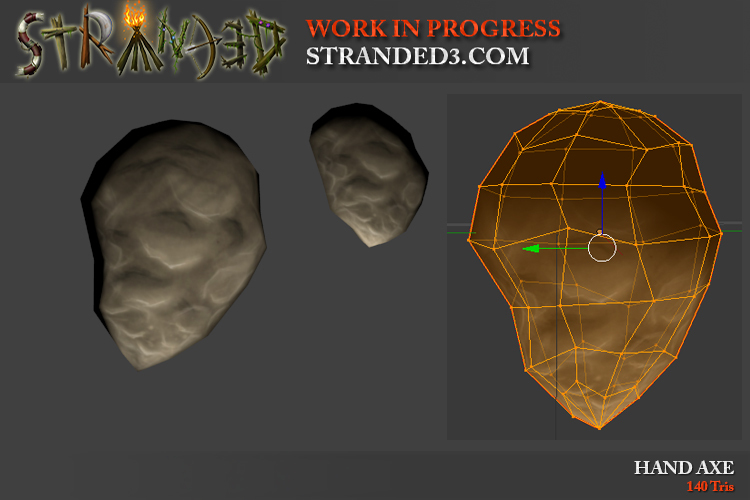 The most complex and powerful approach would probably be a voxel terrain using marching cubes for smoothing. 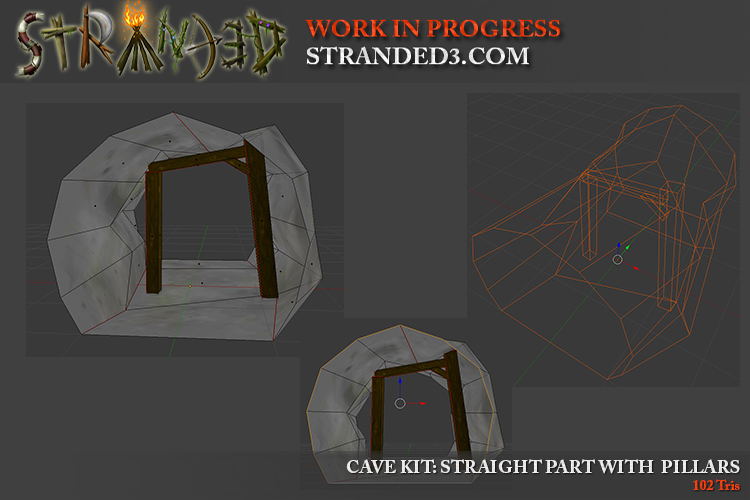 I will however probably just create a cave kit with some pre-built cave elements which can be connected to build different tunnels and caves. 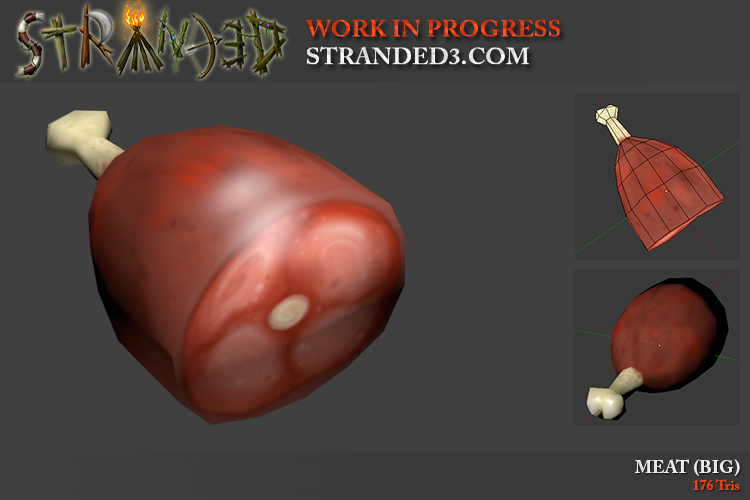 A lot changed since I started to work on Stranded III. Back then Unity's Pro version had a different feature set than the free version. 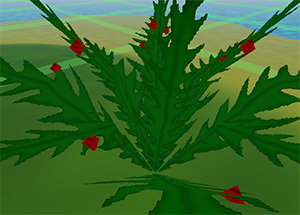 One of the features not included in the free version were asset bundles. Asset bundles allow you to load additional assets - which have been created with the Unity editor - at runtime. Now everyone can use asset bundles and create asset bundles with the free version of Unity. This is a great thing because it allows people to create assets with Unity's editor which is quite powerful and gives you a lot of new opportunities. 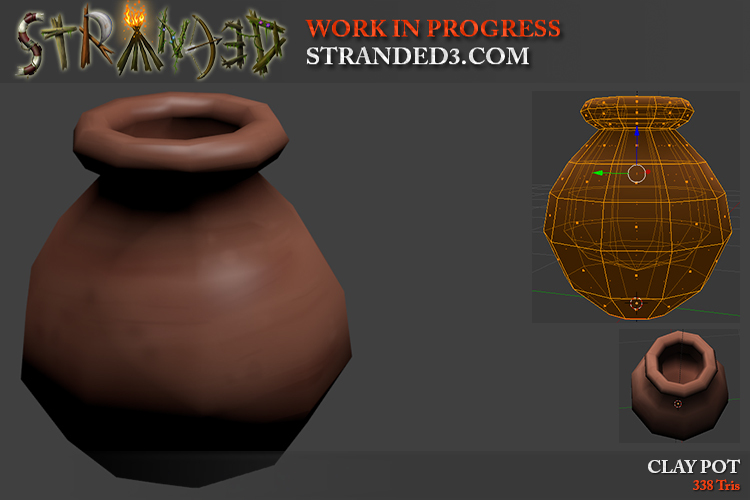 Therefore I want to make use of it in Stranded III. Most Unity games which support modding actually work the same way. Kerbal Space Program for instance or Tabeltop Simulator. So as mentioned earlier my UI is now Untiy UI and this what the main menu looks like now. I also added more fancy particle effects to the main menu because everybody knows that the main menu is the most important part of every game and needs to be finished before everything else... right?! Sorry for the missing mouse cursor in that video. The menu also scales fine with different resolution now. Thanks to Unity UI it's quite easy to layout and anchor things. The target resolution will be 1920x1080 because it's still the most common one. At this resolution you will get the best UI experience. In other resolutions you have to expect up- / down scaling of some assets but it should still look good. I'm also using Text Mesh Pro now which leads to super sharp texts in all resolutions! Hooray! 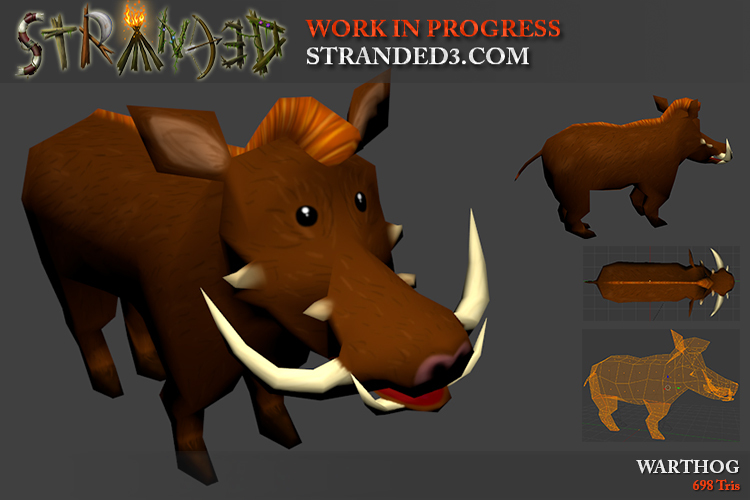 I've been working on a model for a new animal: The warthog! It will charge at you and if you don't dodge you'll fly through the air a bit (and of course get serious damage and injuries). Afterwards you'll probably land on the ground and have to stand up first which makes you very vulnerable to subsequent attacks and other hazards. At least that's the plan. Same behavior would work great for animals like elephants, rhinos and hippos. They don't exist yet but I would love to add them too! Random background information: I moved the domain Stranded3.com from GoDaddy to Namesilo last week. Mainly because it's cheaper - this is actually a ref link! Please register and buy domains - but also because I already have other domains at Namesilo and I don't want to use like 10 different domain providers. It was still at GoDaddy because initially Tom from FPSBanana.com registered it for me and gave it to me later. Thanks again for that nice move! I hope everything still works fine but it looks okay from here. By the way: Yes, I remember that I said that I want to work with placeholder assets and focus on the actual game play. I somehow don't manage to do that though. I need to work on visual stuff too from time to time in order to stay more motivated. This is why I still do models and art things here. I also know however that actual game play progress is more important right now and I'm still working on that as well. I hope to be able to show you more of that soon. Some more UI stuff has been recreated to use Unity UI. I also made some new graphics to make it look better. Note: The yellow cycle is from the recorder (I used Screen2Gif - it's cool!) and shows when I'm clicking. The input field is - except for the box graphic - not my own work to be honest. I just wrapped some code around the input field that comes with Text Mesh Pro. I'm quite happy that I can just use that. I implemented input fields on my own for most of my previous games. That's why I know very well that making a convenient input field with all the cursor and selection logic is actually a lot of annoying work. I'm aware that elephants don't live on tropical islands (especially after someone mentioned that in the YouTube comments) but I think it would be fun to have them in the game so here we go! Elephants will be friendly in general but when you dare to provoke or even attack them you will have a serious problem. The plan is to make them charge at you like the warthog in that case. The difference however will be that they will be able to destroy almost everything in their way while running towards their target. Moreover getting hit by an angry elephant will nearly always be fatal. The model is work in progress and some details still need work. I tried to find an adequate balance of realism and cartoon style which is why the elephant has a huge rear part and quite thick and short legs. The warthog I modelled last time now has a texture. Don't be fooled by its friendly punk look! It can be a very dangerous enemy in the game! This is a rough first iteration on the texture. I want to add some more details later. I might also make it look less friendly but I kind of like its cute, friendly and innocent facial expression. Just imagine that thing charging at you with exactly that face. I think it would be a hilarious experience! Another option I thought about is making the hair on head and back black instead of orange/red but right now I'm happy with the current color.